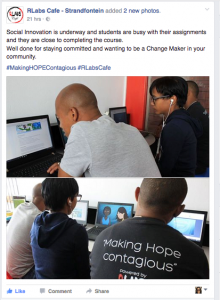 This past month Rlabs, partners in the UCT MOOC Becoming a changemaker: Introduction to Social Innovation, have launched their first in a series of cafes meant to support people to access the MOOC materials offline aimed at the communities which need it most. Becoming a changemaker is a free six week online course that takes participants on a journey of exploring the complex problems that surround us and how to start thinking about solutions. As with most MOOCs it is presented fully online but the new cafe in Strandfontein, Cape Town, creates an in-person facilitation component which is also free. Here students can go for information and get help with assignments or – for those who don’t have easy access to wifi – to access all the content on the internet. The course was co-created by the Bertha Centre for Social Innovation and Entrepreneurship and RLabs, a social movement ‘born-and-bred’ in Bridgetown, Cape Town that is now active in 22 countries; with assistance from the Centre for Innovation in Learning and Teaching at UCT, responsible for producing the university’s MOOCs. Director of the Bertha Centre Dr François Bonnici says that this format of running the MOOC lessens the barrier of access to the internet and data costs as the content will be available offline to the participants and they can use the cafe’s computers to access the course. Local facilitators also assist participants to complete the assignments and stimulate discussions about the specific context of their local community. “The Strandfontein venue is really a place where people can come to connect, to brainstorm ideas and do the course online,” says Parker. “There will be someone to help facilitate the course content offline, to explain concepts and provide further assistance.” He says more of these cafés/campuses are planned – which forms part of their RLabsU initiative – from Atlantis to Hanover Park, as well as other venues across the Cape Flats. Rafaella Gaetano is a young clinical research fellow working in the field of rare diseases at a hospital in Italy. 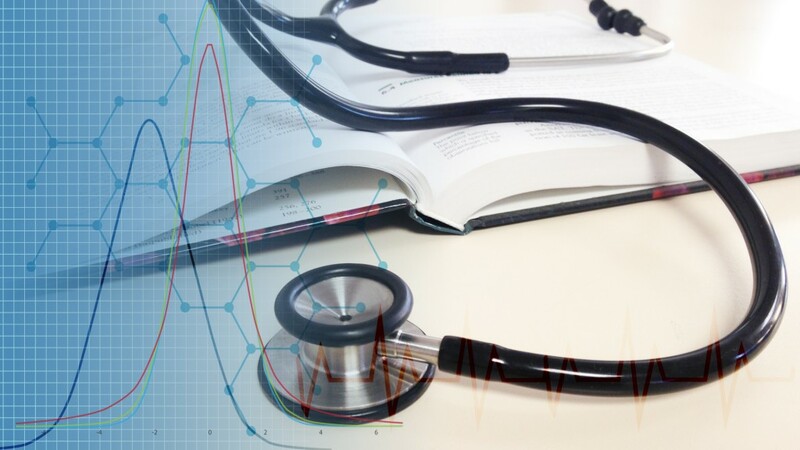 She took the MOOC, Understanding Clinical Research: Behind the Statistics in order to get to grips with statistics in medical research and found the course extremely useful – simple and easy to follow, with appropriate material for her context. Rafaella’s story is very gratifying for Dr Juan Klopper who created the course in response to the ongoing problems his postgraduate medical students were having when starting out on their research. As Rafaella explained, the course really helps to bridge the gap between the researcher and the statistical consultant. Frustrations are common when an inexperienced researcher approaches a statistical consultant for help – there is no common language or understanding on which to base the discussion. That is also why the UCT Clinical Research Centre is promoting the free online course enthusiastically – there is a shortage of taught support courses for clinical research, and an online offering allows for a great deal of flexibility of when you can take it. After launching in December 2015, now almost one year later, over 20 000 people have signed up for the course – which offers a new cohort every six weeks. Reviews left on the course site and on class central have been very positive and it has received a 5-star rating on Class Central, a public MOOC aggregator site. Each time the course runs, there are over 1 000 people registered from across the world. Learners from 91 countries have taken the course and found it helpful – including people from India, Egypt, Canada, Mexico, Nigeria, the US, South Africa and let’s not forget, Italy! The course has proven its ability to cater for a need in many healthcare professionals who do not feel confident in reading and understanding clinical research statistical results. About 40% of those enrolled are postgraduate students – the primary target audience, but 60% are working professionals whom Dr Klopper knew needed support in interpreting and evaluating current medical literature, an essential basis of modern medical practice. “Julia is a language for the future”, words by Dr Juan Klopper, lead educator in the Julia Scientific Programming MOOC. Julia is a modern dynamic programming language designed to address the requirements of high-performance numerical and scientific computing. It is the latest installment in UCT’s suite of online courses and although the topic may seem quite niche, both educators on the MOOC, Dr Klopper and Dr Henri Laurie say their main motivation behind doing this course is to educate those without a scientific background in computing. “If you want a language to reach everybody you need to teach it from the ground up, it needs to go way beyond [being used by] developers,” explained an impassioned Dr Klopper. “In my mind Julia solves a lot of scientific and computing problems but is being used mainly by people with a background in scientific computing.” It is characterized as a language that is fast, easy to use and easy to learn, making it accessible and suitable to learn as a first programming language. A successful outcome of the MOOC for Dr Klopper would be if one person were to say they understood Julia because of this course. 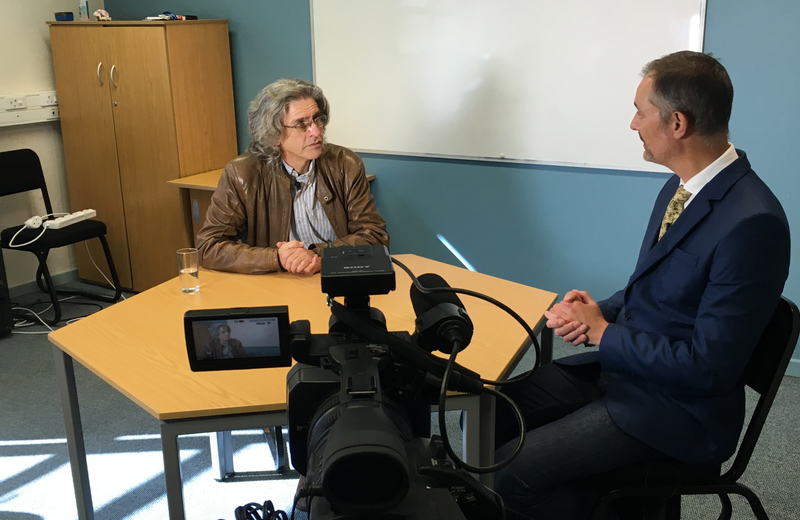 For Dr Laurie it has been an interesting experience making his first MOOC; creating the online course has been fun and enjoyable, he said. When looking at MOOCs and online courses in general he has been intrigued by how rapidly “self-education” has taken off, although he still believes that a university education with face-to-face education is important. On the other hand Dr Klopper promotes the future of MOOCs in higher education, although “not as a replacement of it, that was a silly dream,” he said, making reference to the initial overblown hype in the popular press of MOOCs bringing about the end to campus teaching. “There are a lot of courses that lend themselves to this form of education. People are getting the opportunity to educate themselves.” “I believe, not that MOOCs are a disruption of education but the democratisation of it.” Technology today allows for the physical constraint of a university’s capacity to be “null and void”. Elaborating on why the MOOC format was suitable for the Julia course he explained that as Julia is a new language there are not many open educational resources (OERs) available on it. Although it may be new, Julia has been ranked as one of the top 50 computer programming languages”. Other than enjoying the process of making the MOOC Dr Klopper explained how he too learned new things, “it’s a whole other world compared to my day job and I didn’t mind taking after hours to get it done. I especially liked that I had to learn new things during the making of it and that I learnt from the people at CILT (Centre for Innovation in Learning and Teaching). What did I know about proper teaching, what did I know about assessment, that pushed me a lot. Learning those things from those experts, that was my personal gain”. He added that it may be helpful for academics at the university to engage more with educational experts to design better teaching programmes. What is a Mind? led by Professor Mark Solms. Understanding Clinical Research led by Dr Juan Klopper. Climate Change Mitigation in Developing Countires led by Harald Winkler.